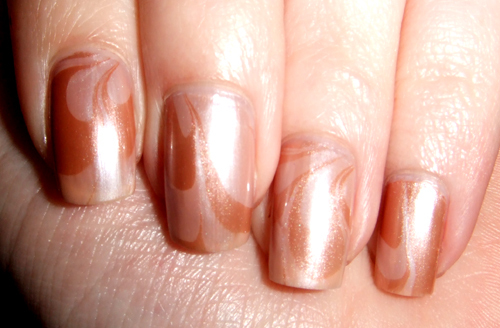 I have (mostly) mastered the water marble! It's tricky, but soooo worth the effort. And it absolutely brings a normal SFW manicure into the realm of interesting. I can't wait to try it with more lively colors. this is probably my favorite manicure to date. Also the hardest to photograph. Damned shimmery colors! all ten nails. This is the first time I've ever managed to marble them all! So proud. Wow, looks lovely. The subtle colours look great.